Like many Texas, we assume that because we have a municipal water source for our homes that the water from our taps is perfectly safe. But, sometimes, it isn;t. Many things can happen to our water between the water treatment plant and our kitchen sink. Pipes can leak adding contaminants and pesticides to our water. Metals, minerals, and other chemicals in the water can interact with metal pipes creating buildup inside the pipes and on fixtures. Old pipes and fittings may also leach lead into the water. Many cities and towns don’t have the funds to address these aging plumbing systems than need repairs. One good example of municipal water problems was recently reported by CNN. (CNN)Virginia Tech engineering Professor Marc Edwards watched as water flowed from a garden hose in Enterprise, Louisiana. As he moved a jar to catch a sample, the color changed from clear to brown. “When mine comes out, it comes out black,” Enterprise resident John Tiser said as he watched Edwards work. Tiser, Enterprise’s newly appointed water board president, was giving Edwards a tour around this rural community in central Louisiana, where residents have struggled with water problems. He says his wife drives 20 miles each direction to do laundry in a town with clear water. Concerned about the potential health effects for his family, including his two daughters, he ran for a seat on the local water board. Years of water system neglect means that the 250-or-so residents there are left with pipes that leak more than 70% of their water into the ground, Tiser said — all because they can’t afford to fix them. “We’re basically putting Band-Aids when we need to go to the ER. That’s where we’re at,” he said. It’s what Edwards calls America’s “dirty little secret.” He explains it this way: That often times towns like Enterprise are stuck with aging infrastructure that they can’t fix, leaving few options for them to deal with complaints about dirty or contaminated water. The US Environmental Protection Agency says the nation needs $743 billion to fix America’s water system. In his wife’s minivan, complete with acid stains on the carpet, Edwards says he makes long drives to small towns that are hurt by dwindling populations, and slowly being forgotten. “It’s the perfect vehicle. I couldn’t take a rental car, because I can’t explain why there’s acid burns in the seats of those. But that van’s seen a lot of bad water,” he said. Edwards has spent nearly two decades testing water and challenging federal, state, and local governments on water quality. His work helped to reveal high levels of lead in the water in Flint, Michigan. Edwards says Virginia Tech, where he is a professor, supports his work, as long as he can afford to pay for his travel, which he has done for years. He has since received an EPA grant of nearly $2 million to seek out water issues in towns like Enterprise. The EPA and the federal government do offer grants and loans to towns. But, states can’t afford to swoop into every town and fix the aging pipes in homes, buildings and structures. In many cases, that falls to property owners. In 2017, Edwards and a team of scientific and academic researchers tested the water in Enterprise and found bacteria, lead and other contaminants that exceeded EPA limits. It’s an expensive problem, and each week she says she buys about 10 cases of bottled water. Vinson’s water provider, Enterprise Waterworks Inc. sends out periodic “boil water notices” warning customers of things like “questionable microbiological quality.” It’s something everyone is more than aware of. When CNN was in Enterprise to meet with Vinson, her home was under a boil water advisory. However, the US Centers for Disease Control and Prevention warns that boiling water with lead in it, can actually make the level of lead higher. Medical experts warn there is no safe level of lead in the body. Louisiana alone would need about $10 billion to fix its water system. That’s money it does not have, the office of Gov. John Bel Edwards told CNN. The American Society of Civil Engineers has given the United States a grade of D when it comes to drinking water infrastructure. While the majority of the country receives safe drinking water, the EPA says thousands of systems in rural America are deemed “serious” violators of federal law because they don’t meet federal standards. 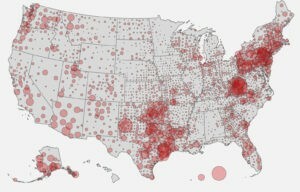 The EPA told CNN that more than 300 million Americans depend on 50,000 community water systems across the country for safe, reliable water every day. Over 92% of the population supplied by community water systems receives drinking water that meets all health-based standards all of the time. “The United States has world-class drinking water standards for more than 90 contaminants, including microorganisms, disinfectants, disinfection byproducts, inorganic and organic chemicals, and radionuclides-providing Americans safe and healthy water to drink,” the EPA said. But, a 2018 EPA report found that nationwide, nearly one-third of the nation’s public water systems had at least one violation of the Safe Drinking Water Act. Those systems serve more than 87 million Americans. In 2016, the EPA reported nearly 8% had violations of health-based standards. About 3% of public water systems were serious violators, typically with multiple violations over a sustained period. But, multiple government reports over the years show that the water quality issue may possibly be much worse, especially in rural America, because local communities may not always be accurately reporting their data. Kildee says he often hears from other members of Congress who suspect water issues in their towns, but can’t get help from the local leadership. And, he says, the federal government just isn’t motivated to take on the true cost to fix the problem. The EPA estimates $132.3 billion is needed to repair small water systems in America over the next 20 years. But, in 2017, only $805.7 million was allocated to these systems — about 12% of the amount needed. “They don’t want to talk about it. Because, they understand that there’s a consequence that comes with it,” Kildee said, referencing the financial consequence of dealing with failing infrastructure. “I think a lot of people in public office just want to kick the can down the road until they’re not around anymore. As the cost goes up, so do the water bills, placing the financial burden on the shoulders of 200 households, “and we don’t have clean water on top of that,” he added. Because Enterprise is in debt, the Louisiana governor’s office says the town is not eligible to apply for the grants to communities to improve bad water systems. If you think you may have water contamination issues, leaks or any other plumbing concerns, call Berkeys today. We’ll inspect your plumbing system and provide quick, reliable repairs so you home has the highest quality water in every tap.